In the business of everyday life, a lot of us struggle with the need to survive. The basic necessity of survival may not be as simple as some may think. For a lot of Americans, living paycheck to paycheck is a natural way of life. Some of us rely on federal programs such as Social Security, WIC, welfare or food stamps just to make ends meet. Others work themselves to the bone earning minimum wage or salaries that just don’t suffice. Many families around the country face different hardships such as disabilities, unemployment, and poverty, that hinder their ability to survive. Some of us may feel as if we work for “nothing.” We live in a rat race, and no matter how hard we work we always seem to fall short every month. We’re forced to play the juggling game between a roof over our heads or food on the table. Nevertheless, we do it! Americans across the country find a way to make it, day by day, to push forward and persist with love, hope and a plan. As the New Year begins I encourage all Americans to make a plan, not just to survive, but to do one better! Don’t be a victim to circumstances. Take a look at your situation, set goals for yourselves, and finally develop a plan of action to achieve each and every goal. A lot of us are predictable with New Year’s resolutions. We announce our desires to lose weight, quit smoking or become a better person. Once again, these too have topped my list. However, I’ve also made a spot for surviving and living–financially that is. My plan of action is to SAVE! Save for the present so I can save for the future. It is impossible to save for one’s future if we have nothing to save in the first place. However, there is hope. Saving comes in many forms; in fact, a lot of us may not realize that the little things we do affect our finances, which in turn helps our savings. We set the timer on our heaters, or turn off the lights when they’re not in use. We make purchases of Energy Saver appliances, light bulbs, and fuel-efficient cars. We search for bargains on car insurance, cell phone plans, and even cleaning products and groceries. All of these things and so much more, as little as they may seem, do help us save! So this year, why don’t we all pledge to save–because we all know every little penny counts, and it’s easy! I made my pledge and started couponing this week! Let’s start with a newspaper. Scan the advertisements of your local supermarkets and grocery stores for items discounted for their weekly sales. 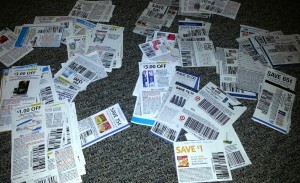 Clip any and all coupons that stores are offering, even if you think you may not need them. Check current magazines or newspaper inserts you may have lying around the house for manufacturer coupons for even bigger discounts. Print coupons online. Also, familiarize yourself with the coupon policies of all of your local grocery stores. Some stores allow you to double-up on coupons for even more savings! Remember to also sign up for loyalty rewards programs such as Foodland Maika’i Program rewards, Safeway Just for U program, and CVS ExtraCare. Other useful tools–thanks to today’s evolving technology–are mobile apps available for your smart phone, such as Target’s Cartwheel app. These convenient bits of technology could add triple savings on your next shopping trip! Don’t forget to check clearance racks and in-store specials, and remember to keep those register coupons, or Catalinas, for savings on your next shopping trip! As you can see, saving does not always have to be hard. It can be easy, with just a little preparation and planning. So let’s all start saving! Remember that a penny saved today can be a penny saved for tomorrow: for all those “rainy day” events, retirement options, or long term investments such as purchasing a home, buying a car, or even going on a family vacation. Are you ready to make your pledge to save? Remember it starts with YOU and it starts TODAY!